Today I have a giveaway for Little Princess fans, you could win one of two copies of the DVD I Don't Want To Go To Bed. 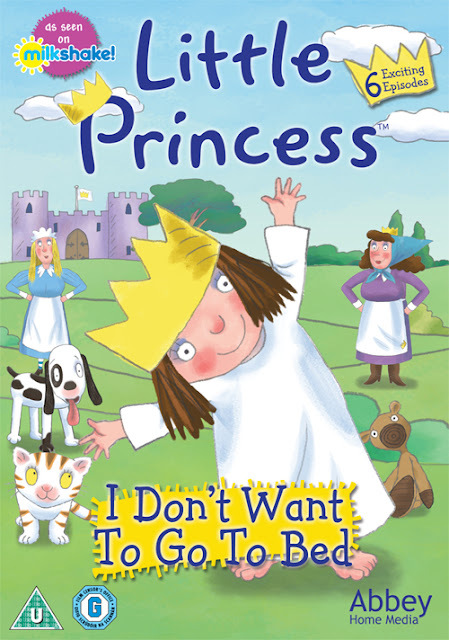 Abbey Home Media are excited to announce that their first Little Princess DVD is due for release on 2nd April and called " I Don't Want To Go To Bed." Based on the best selling books of Toby Ross, Little Princess is a hot on Channel 5's Milkshake. This first DVD contains 6 episodes of this animation. With voices from Julian Clary and Jane Horrocks, I Don't Want To Go To Bed see's the Little Princess lose a tooth, learn to accept help from friends and find value in a night's good sleep. If your little one is a fan of the Little Princess then you can purchase the DVD from 2nd April from abbeykids.co.uk, Amazon, ASDA, Sainsbury's and all good retailers. I am also excited to be able to offer two of my readers the chance to win a copy for themselves. Just complete the Gleam entry below. Good Luck! my little ones are obsessed with watching stick man at the minute! other than that we tend to watch a lot of paw patrol, mickey mouse clubhouse fireman sam and my little pony!!! Paw Patrol at the mo! She's into the 1960s Batman show at the moment - but only the third series with 'Princess' Batgirl! My niece loves Paw Patrol and PJ Masks. My granddaughter enjoys watching Peppa Pig. My daughter loves Andy's Dinosaur Adventures. Her favourite show is Horrid Henry despite my best attempts at encouraging her to watch nicer ones. It's currently Ben and Holly.